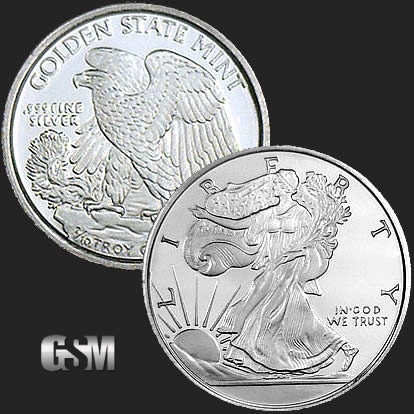 The 1/10 troy ounce Walking Liberty Round by Golden State Mint offers greater flexibility than the larger 1/2 oz, 1 oz or 5 oz sizes. These medallions are IRA approved and struck in .999 fine silver. Fractional silver rounds are popular choice among first-time buyers or those just adding to their stack. The design of this fractional silver medallion features a full-length figure of Liberty, the folds of her dress flying to the breeze as a background, progressing in full stride toward the dawn of a new day carrying branches of laurel and oak, symbolical of civil and military glory. The hand of the figure is outstretched in bestowal of the spirit of liberty. The reverse of the half dollar replica shows an eagle perched high upon a mountain crag.